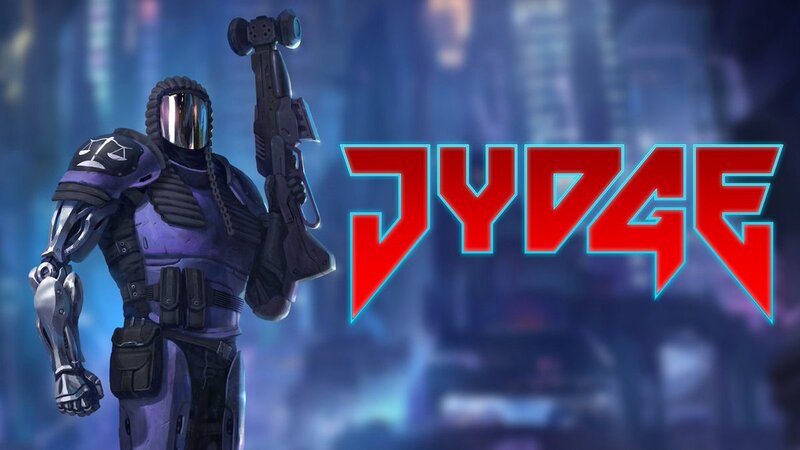 After releasing Neon Chrome last year, 10tons ltd has created a new game, JYDGE, which takes place in the same universe, but many years before the plot of Neon Chrome. In a distant future where chaos rules in the city of Edenbyrg, special units of policemen are sent to neutralize gangsters. They are called JYDGES. You have a large collection of weapons to help you. Fire power, stealth and tactics will be needed to overcome obstacles. Will order prevail again? Walls can be destroyed if you want to go faster. 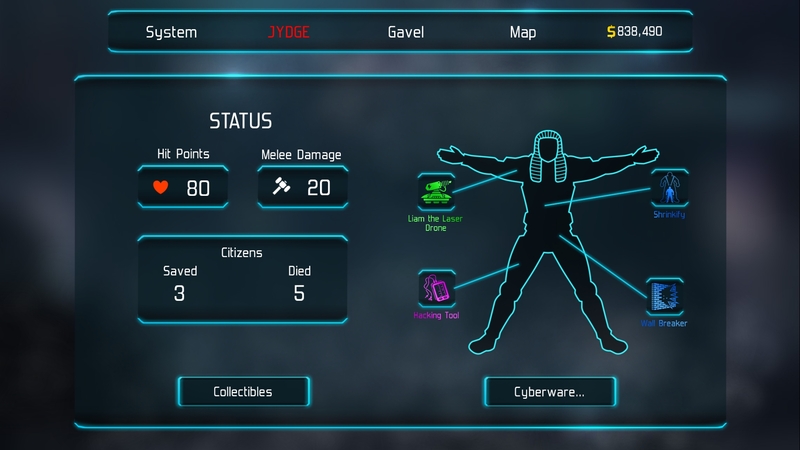 JYDGE is a clear tribute to Judge Dredd, but this does not mean the game will rely on pure brute force. Your cop has to complete different objectives and will be asked to protect citizens, collect evidence or defuse bombs. In order to beat a level, you need to complete the first objective and to escape with your car. Completing optional goals rewards you with additional golden medals which are needed to unlock new weapons and upgrades. Upgrading your equipment will be an important part of your progression. 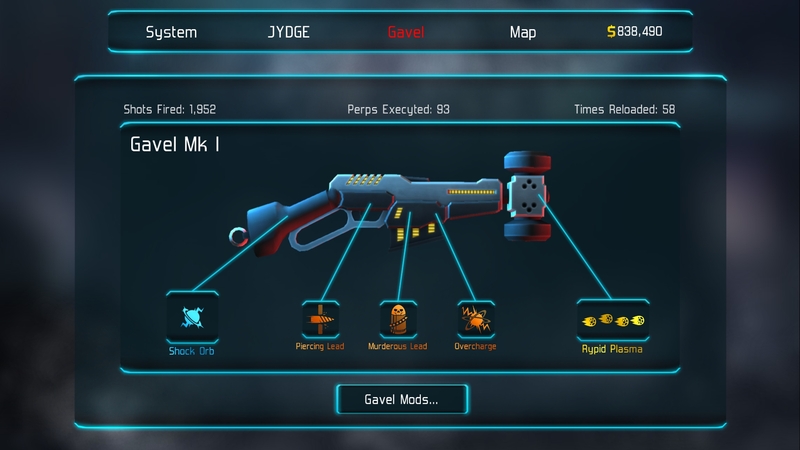 You can upgrade your gun, called “GAVEL”, your cyber equipment, or your secondary weapon. Upgrades will make your life easier and are needed to complete some missions. For example, there is an upgrade which will make you invisible as long as you don’t move. It is very helpful in missions whose optional goal is to remain undetected. If you combine it with a sniper rifle, which you can purchase later, you will become a very talented hitman. Some upgrades also make it harder for citizens to die, and since you often have to help them, this will help you a lot. Upgrades not only require golden medals but also money, which is obtained by completing missions, killing enemies, and looting containers. Levels can be replayed as many times as you want to farm cash. It is interesting to note that you are going to unlock up to 4 different difficulty modes, each mode rewarding you with 3 different golden medals. This means that if you complete a level in all difficulty modes, you will get a total of twelve medals. This provides an incentive to replay levels with different goals and a different approach. 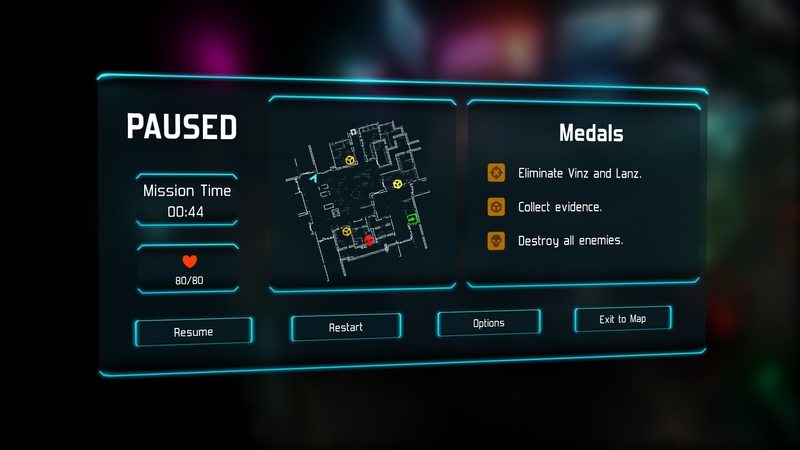 Higher difficulty modes provide tougher enemies, shorter time limits, and require some thinking and a tactical approach. The upgrade system provides an incentive to try out those challenges, and in order to unlock all the weapons and upgrades in the game, you will need a total of 140 medals and a lot of money. This approach works well, though some upgrades feel a bit less effective than the others. For example, you have the possibility to buy drones or gangsters to help you, but their AI is lacking and they seem bound to die very quickly, so you may want to save a slot in your armor for a more effective upgrade. The game is well optimized and loading times are very short. Graphics are well made and a lot of elements from the backgrounds can be destroyed during fights, which adds to the fun. The art of the game could be described as cyberpunk, and the different soundtracks played during the game convey the feeling of living in a future filled with cyborgs and advanced weapons. The bestiary is also a clear tribute to the 80 and 90’s. A lot of the enemies look like punks and a few of them are even giant spider robots. 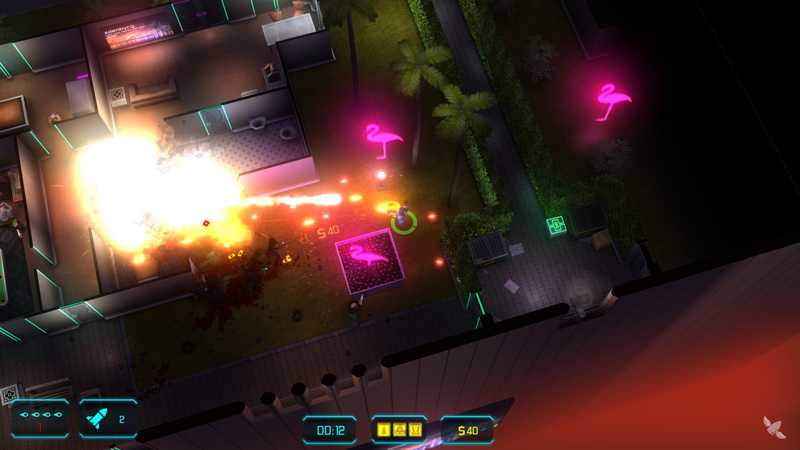 Most of them use laser weapons or missiles to attack you, but a few punks resort to close combat, and must quickly be dealt with as they inflict a lot of damage. While the game only has 18 levels, the different challenges, difficulty modes and upgrades available greatly extend its lifespan. It will take you some time if you want to unlock all weapons and upgrades and max out your damage. The possibility to have a partner join your game locally will certainly add some fun. It took me 40 hours to beat the game two times, as the game features two different endings based on your actions. I unlocked all of the weapons and upgrades but did not maximize all of them, and I still have a lot of optional challenges to complete. Sold at the price of $14.99, JYDGE is an entertaining action game which will help to kill your time.